This year’s Christmas program includes a humorous story poem, “The Untold Adventures of Santa Claus” by New Hampshire’s Master of Light Verse, Ogden Nash, and a wonderful memoir, “Christmas in Our Town,” written by Hanover’s Alice Van Leer Carrick. Join us this evening at 6:30 in Taylor Community’s Woodside Building for this free event. Pontine Theatre is a two-member ensemble founded in Portsmouth, N.H. in 1977. 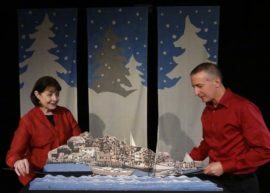 Using puppetry, masks, toy theatre figures and projected images, Pontine brings New England stories to life onstage. Pontine is a resident company at Strawberry Banke Museum.